While there are several tweaks and steps you can take to test and improve your internet connection speeds, one of the easiest and quickest ways to speed up your web browsing is modifying the Domain Name System (DNS) servers. 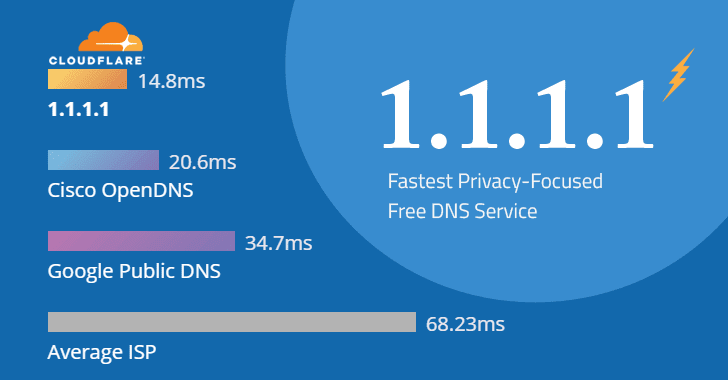 Read on to learn how Cloudflare's new 1.1.1.1 public DNS server can speed up and secure your web browsing. DNS is the Internet's master phone book. It turns human-readable domain names, such as nebulanewengland.com, into Internet Protocol (IP) addresses such as 198.49.23.144. For all practical purposes, every time you go anywhere on the internet, you start by interacting with DNS. This takes time. A complex webpage can require multiple DNS lookups -- one for the text, another for an image, another for an ad on the page, and so on -- before your page loads. Each DNS lookup takes an average of 32 milliseconds (ms). That really slows down many websites. So, when you speed up your DNS lookups, you'll get faster internet performance. While Cloudflare's 1.1.1.1 is fast, it's biggest improvements comes with protecting your privacy. When the Federal Communications Commission gutted net neutrality, it also opened the door for ISPs to track all your internet searches. ISPs can, and are, selling your browsing data. That's it. The next time your computers look up a website, they'll use the 1.1.1.1 DNS services. On Android, it's far harder to set up DNS than with other operating systems. The easiest way, which works across most Android devices, is to install DNS Changer. This works by creating a local VPN work on your device. This VPN only exists within your device and your mobile or Wi-Fi connection. To use it, you place 1.1.1.1 and 1.0.0.1 in as your DNS entries.